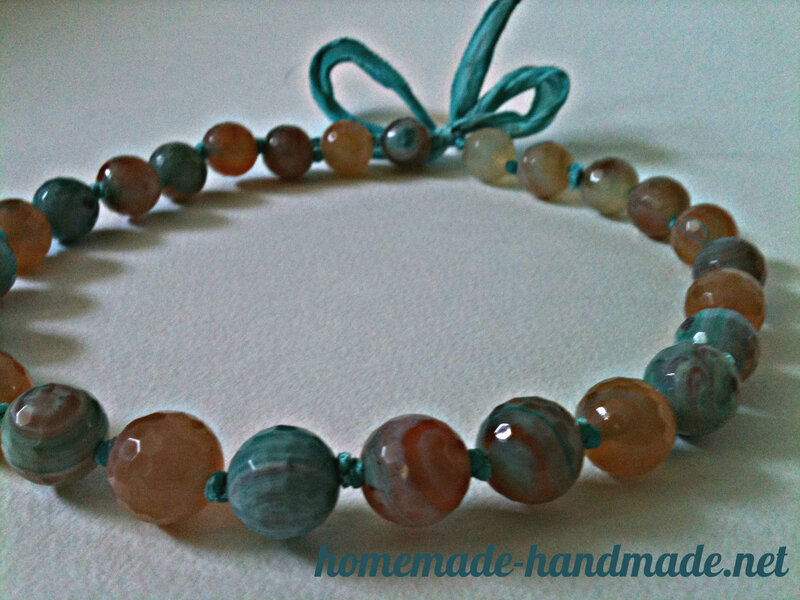 Its been a long time since I posted about jewelry making. It’s not that I haven’t been making anything…I haven’t done much this year, but I’ve done a few things, and a lot of thinking. Over the next few months, I want to take some time to talk about jewelry design. We’ll do some how-to and tips and general knowledge sharing too, but I think one thing that a lot of jewelry makers struggle with is transitioning from learning how to make jewelry to how to design jewelry. Frankly, a lot of brilliant jewelry designs are based on serendipity—a designer just playing around with combinations and stitches arrangements until everything falls into place. And I think that a lot of jewelry makers, especially when they are first getting started, are so proud of finishing something that was their own idea that they stop there and don’t think about what next steps could be. That was one part of working for a jewelry making magazine that I really liked: We were always tasked with finding the best way to do something or explain it. The first try is rarely right, but once you know the principles and basics those pieces click into place much more quickly. 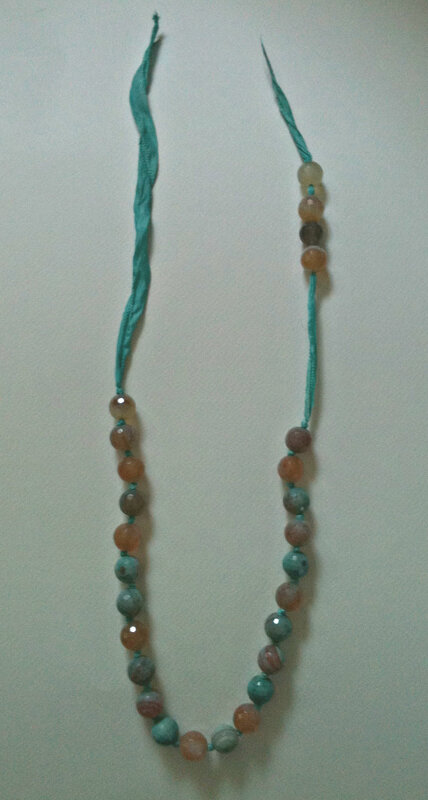 So, around the time I made this, I made another necklace with these gorgeous peachy/aqua faceted gemstones on a thin silk cord. 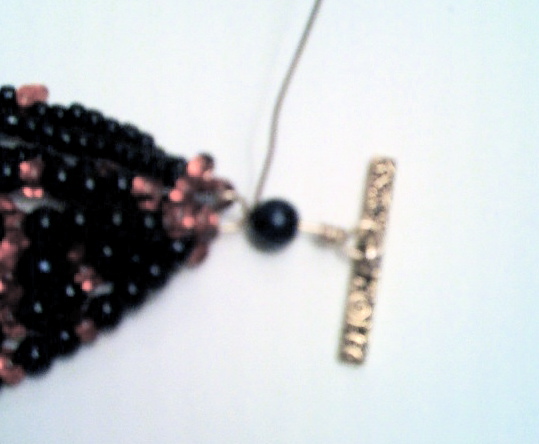 But after a year, the necklace was fraying and stretching and I needed to redo it. I’ve always wanted one of those pretty ribbon necklaces that tie with a bow, so I decided to that approach for the redo. 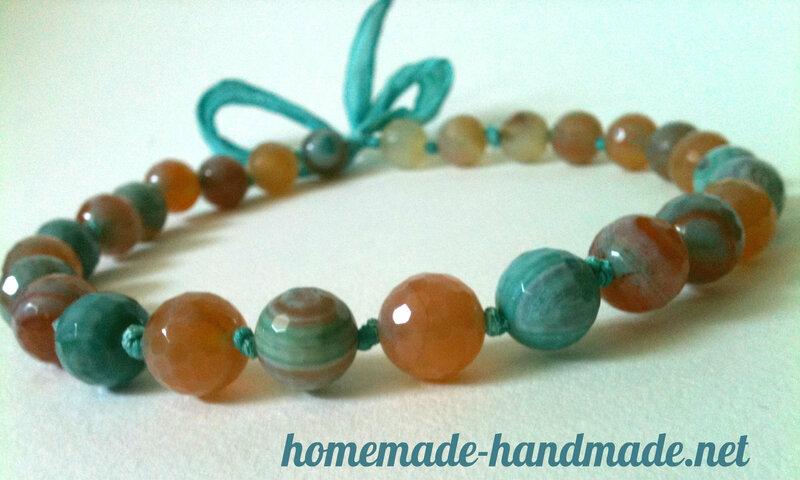 Stringing a necklace on a wide ribbon is easy, as long as you can twist the end of the ribbon into a point. 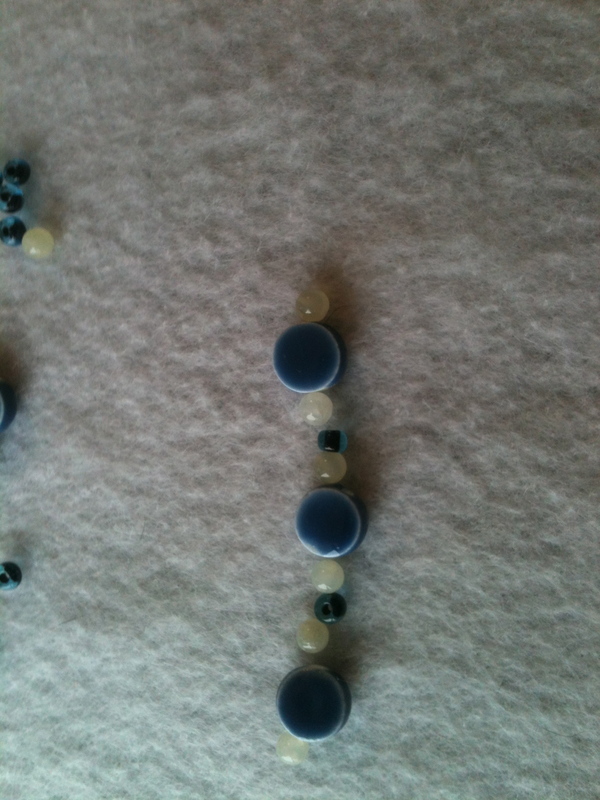 Then you can thread the beads on one at a time. 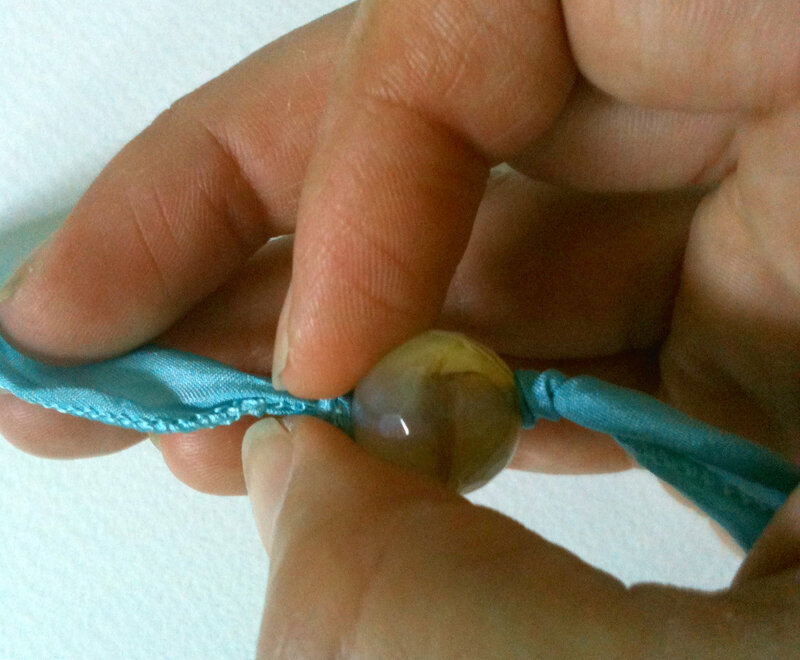 Push a second bead next to the second knot, and tie the third knot like the second, pulling it close to the bead. 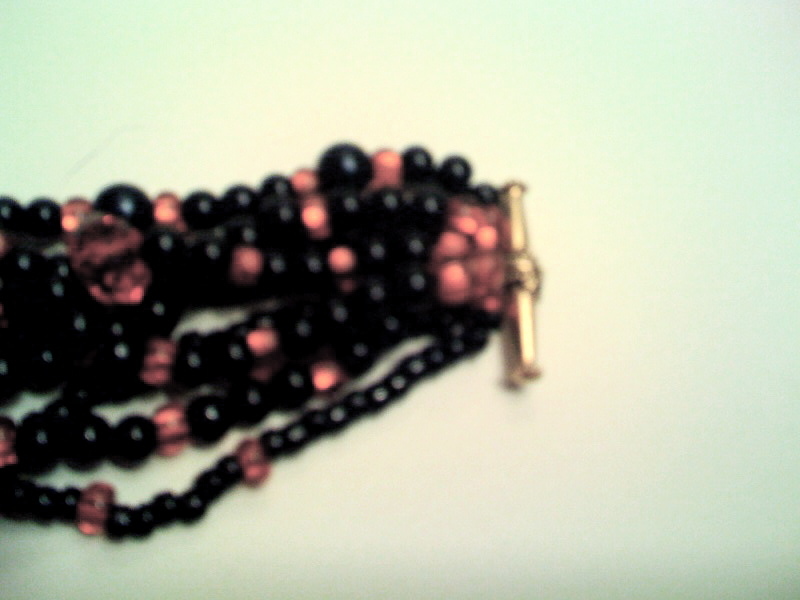 Keep knotting and sliding, keeping the knots as close to the beads as possible. As you pass the halfway point, check that the ends are even. 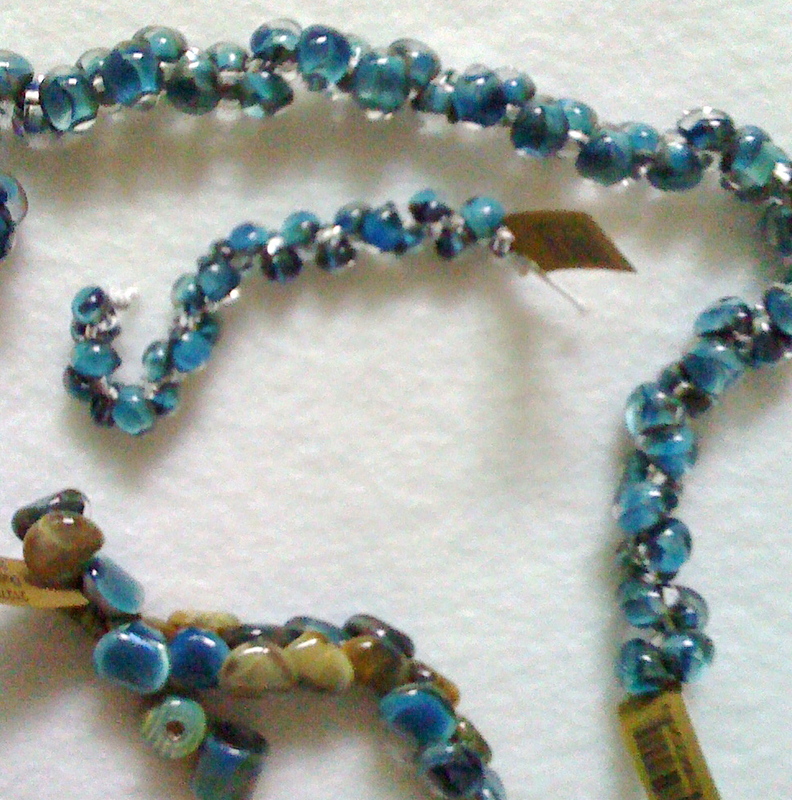 If not, you may need to remove beads from one end and string them on the other end to even the ends. Finish knotting. Use a bow to clasp the necklace. When I went up to visit Lesley a few weeks ago, a strange role reversal happened. We sat at the kitchen table, Lesley working on our stars, and me beading. I wanted to make a beaded glasses cord for my mom (actually, she’d specifically requested it) for Mother’s Day, and obviously who better to help me than Lesley? We went to Michael’s, and I got some beads and clasps for the ends–we looked for but couldn’t find the black rubbery grips for glasses. Instead we realized that we could put large lobster-claw clasps on the ends; this would make it more interchangeable anyhow, so I think this is actually better. You can just clip the clasp onto the rubber grips–and as a bonus, you can clip the clasp together and wear the chain as a necklace. 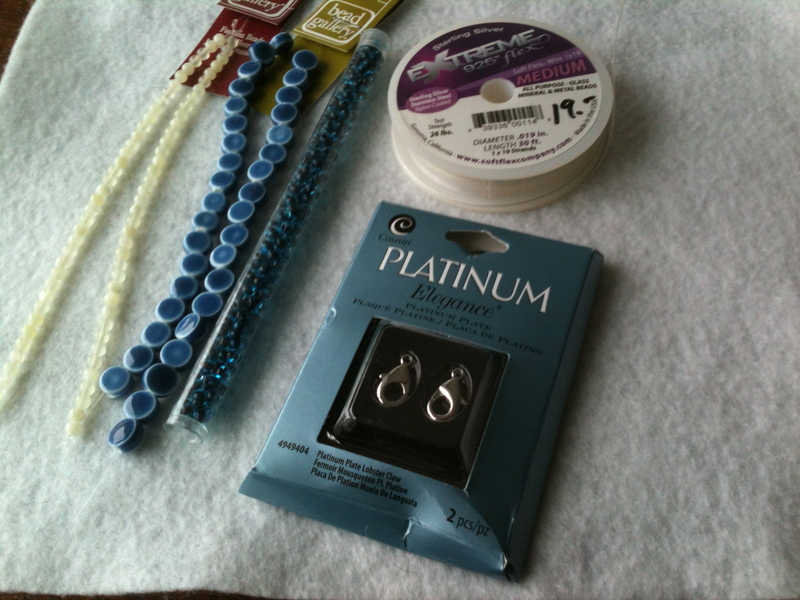 I started with these supplies (I bought the two strands of beads and clasps, Lesley provided the seed beads and wire). Anyhow. I started by pulling just a few of each bead free on my flannel mat (which makes it a lot easier to not send beads flying everywhere whenever you breathe) so I could play with some layouts. 1. 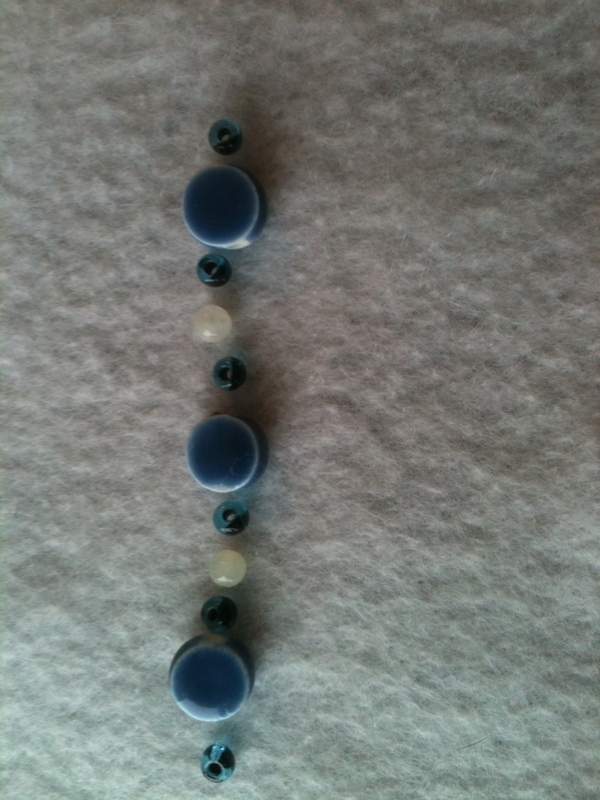 Put first bead on wire. 2. Push a few inches down. 3. Put next bead on wire. 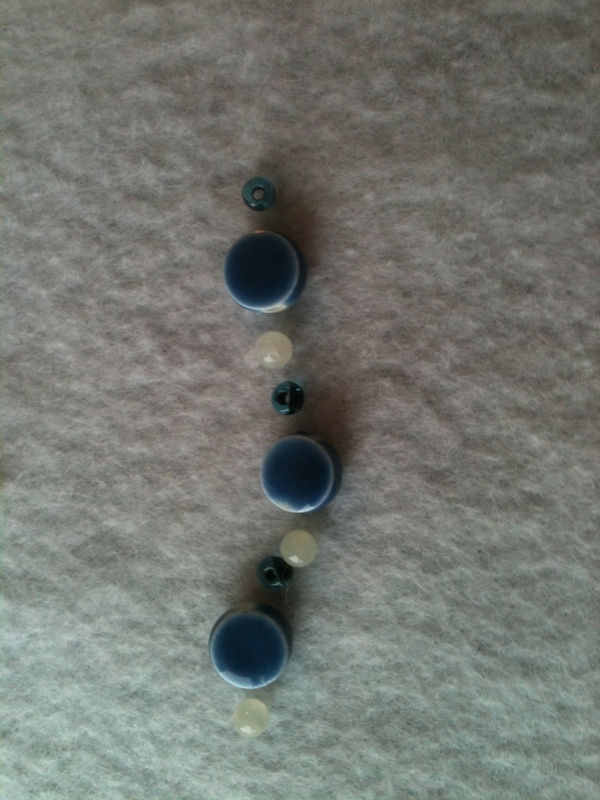 I did that until I had used up all my blue disc beads (seemed like a good place to stop). But obviously I couldn’t leave it with a loose end. I did not take pictures of this step (not just because all I did was watch) because Lesley said to send you here if you want to know how to crimp. It’s step-by-step instructions for three ways to do it. You’re welcome. And here we are, a lovely glasses cord for my lovely mother. I hope you don’t break it too quickly, Mother. Lesley did a nice job crimping it, after all. What did you get your mother for mother’s day? *If you do not have Lesley, my other recommendation is magic. Sorry, don’t know what else to tell you. Pretty sure that was the hard part. P.P.S. This is Lesley. Crimping is easy! Just watch the video Mary linked above. 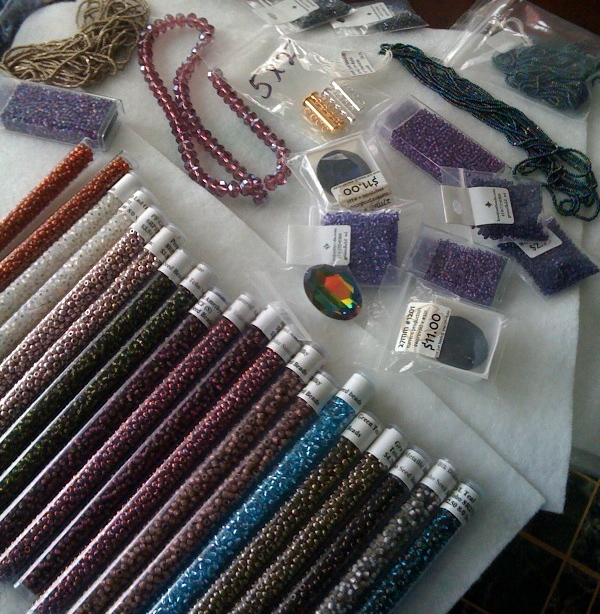 This last week has been crazy-busy as I’ve been preparing to give a presentation to the Bead Society of Greater Chicago. I drove down last night after work and spent some time with their beaders talking about design and how really knowing the basics allows you to be more creative and get better finished pieces. I had a hard time narrowing down one topic to talk about. Originally, I was going to go “three miles wide and an inch deep” and go through 50 tips for better beading. But the more I worked on the presentation, the more I realized that everything was leading back to the basic premise that to create your best work you need to know the basics. Not just basic design concepts, like line, shape and movement, but the basics of your tools, materials and techniques and actually consciously choose how you’re using all these elements. Of course, in the end, I ended up talking about publishing designs, working on a magazine, and copyright. Maybe next time I’ll plan to start there! Do you see the problem? There’s not enough room for the toggle bar to swivel and fit through the clasp loop. I even tried stretching the strands to increase the length, but as I used DandyLine, that didn’t help at all. I had to make a choice: Cut the thread, or cut the clasp. Yep, I said cut the clasp. 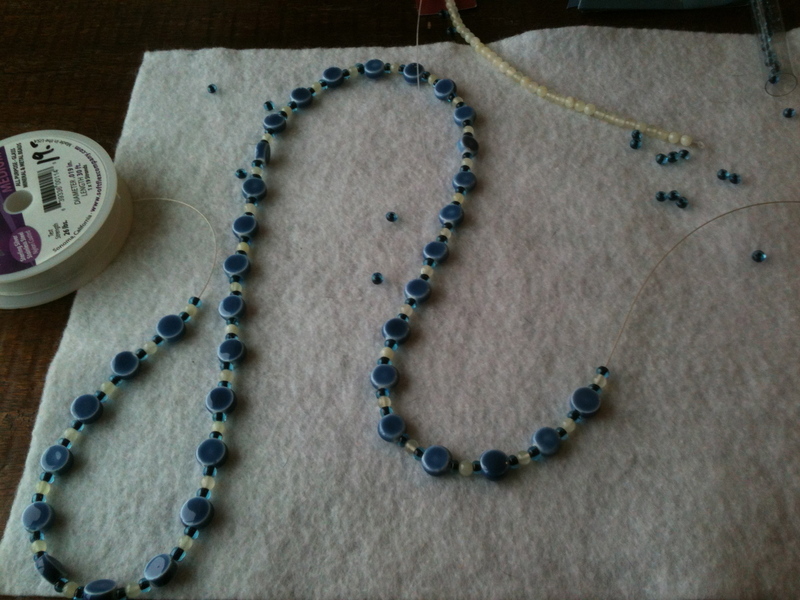 This is a nine strand necklace, and it took me about 5 hours to string (if not a little longer). Restringing it would be a little faster, because the pattern is already set, but the holes on some of the round beads are really small (so I couldn’t just run a needle up the strands). It would probably take me about 2 1/2 hours to restring. Cutting the clasp would mean I’d be out a clasp, and, if I couldn’t slide the thread loops on another clasp loop or wire, I’d have to restring anyway. Now, if this was an expensive clasp, I wouldn’t even consider it. But this was a $2.00 base metal clasp* I got on clearance, so I didn’t think it was a big deal to wreck it. I did the same thing on the other side. I think the end result turned out very nice, and it’s actually possible to close the clasp, which is a nice feature in jewelry, don’t you think? * I’m usually an advocate for high-quality materials (they look better and last a lot longer! 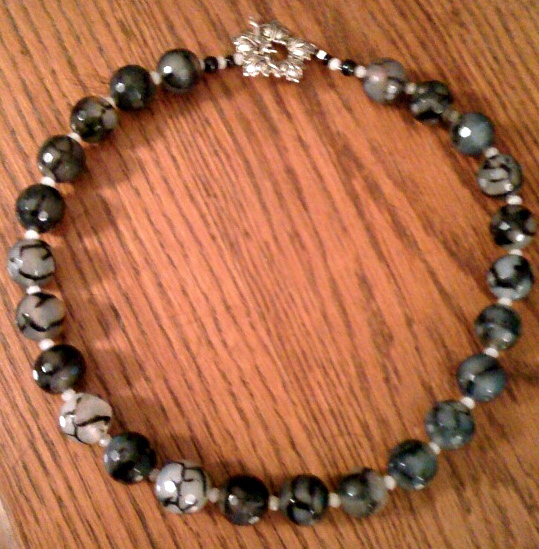 ), but this necklace was made entirely out of demonstration leftovers and bargain bin glass. I don’t spend a lot on demo materials, since I give them away. 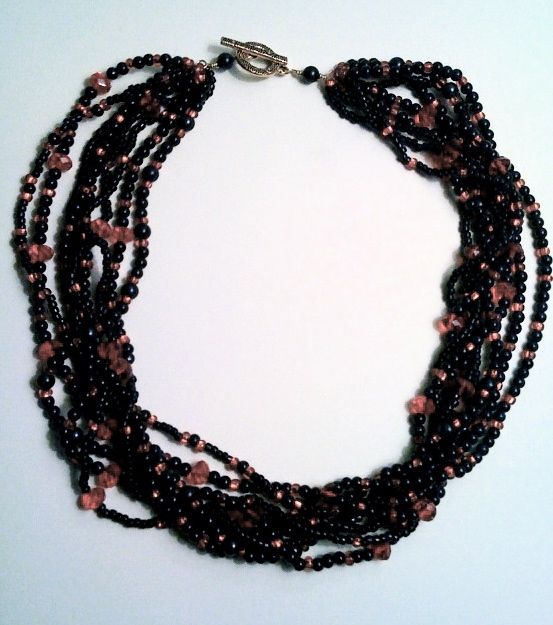 Since the clasp and black rounds were purchased for demonstrations, and the wire was leftover from another project, the only materials I bought for this project were the faceted rondelles ($1 a strand) and two tubes of seed beads ($6). I pretty sure that if there’s a time to use a base metal clasp, this is it. † Anytime you are combining thread and wire remember to use a soldered or wrapped loop. Even if you’re an expert at closing jump rings, thread can slip right between the wire ends. 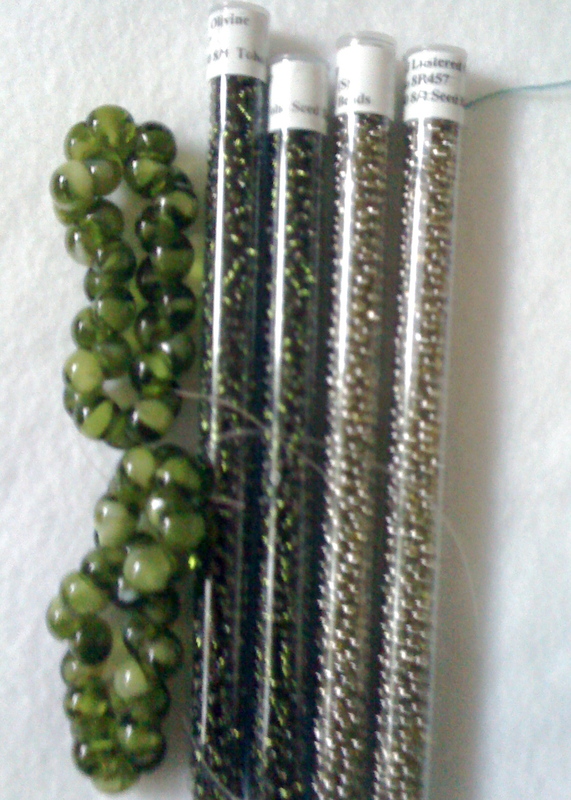 I purchased these strands at the Bead&Button Show a few months ago, and I actually have a finished piece to show for it. Two things I like about this project: 1) It was very easy. I strung the entire piece and attached the clasp in about an hour. 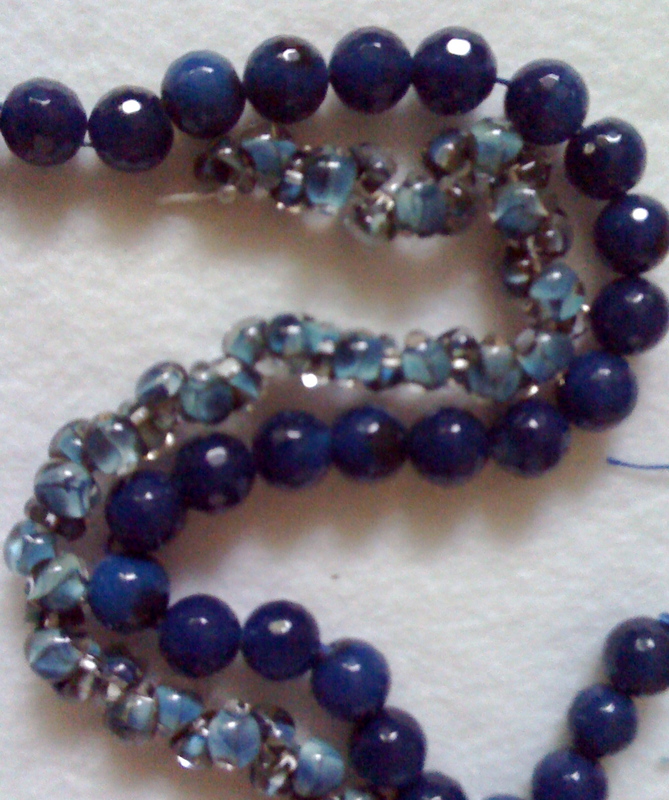 2) The strand of gemstones was too short to make a necklace on its own, but adding the rondelle spacers not only increases the length, it enhances the colors, distributes the weight of the necklace more evenly, and helps it curve more smoothly. All good things. Have you made any unexpectedly simple projects lately? Isn’t it great how something so easy can be such a great impact piece? I’m still recovering from bead show week. So many people to catch up with and things to do. I haven’t seen some of my former coworkers in a year, and I was able to meet some of the designers I worked with as an editor for the very first time. My students were all awesome—not a bad one in the bunch—and I walked away with some great ideas to keep me beading throughout the year. And probably enough materials to keep me going throughout the year too! Today, I’m going to share some of the great things I found at the show. Now, I usually try to be frugal, and I’ll admit I blew my budget this year. Why? Because while there are some world-class bead stores right here it town, the show gives me an unparalleled opportunity to see everything that’s out there and compare prices. I got a number of bargains, so I’ll probably be diving into this stash for quite a while. Maybe until next year. 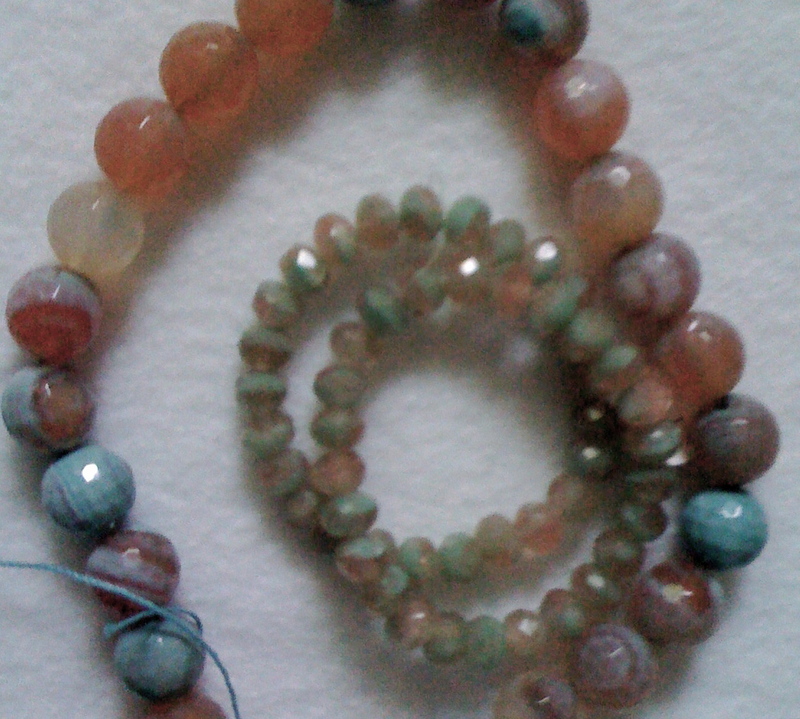 One of the very first booths I stopped at had these lovely agate strands in a wide variety of colors—some natural, some dyed. And the price was pretty great. I love gemstones, and I think that there’s something classic about strands like these that make them easy to adapt to a variety of projects. 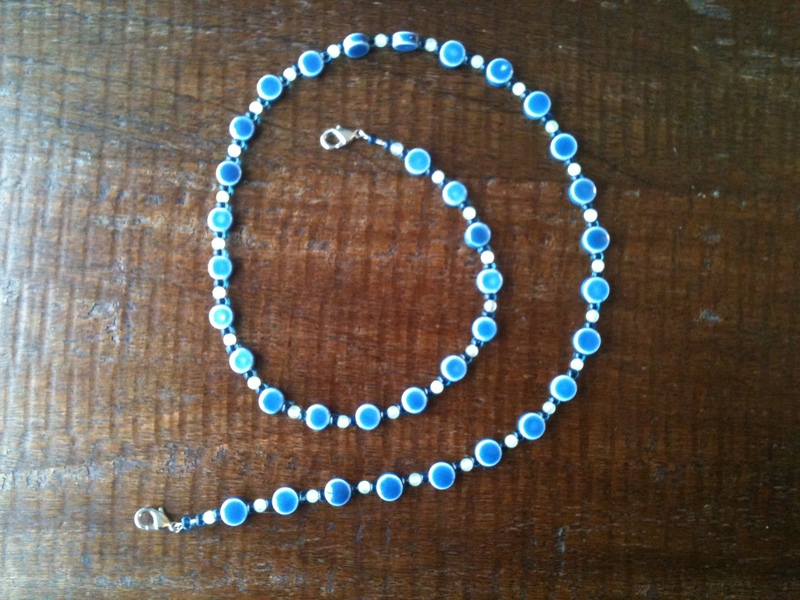 Next, I went on the hunt for something a little more lightweight (those heavy gemstones can be a literal pain to wear!). Glass seemed to be everywhere, and in a wide range of styles. At Unicorn Beads and Sonoran Glass, I saw a few variations of similar ideas. And some of them made it home with me. I also found some treasures while rummaging through the piles of pressed glass at Raven Imports (where I bought all the pressed glass used to make this necklace for Bead&Button a few years ago), and found some great rondelles and vivid green drops. My other great finds includes some very inexpensive Swarovski bicones, strands of mercury-colored faceted glass, and lots of wire and headpins. I also found plenty of dollar strand sales. 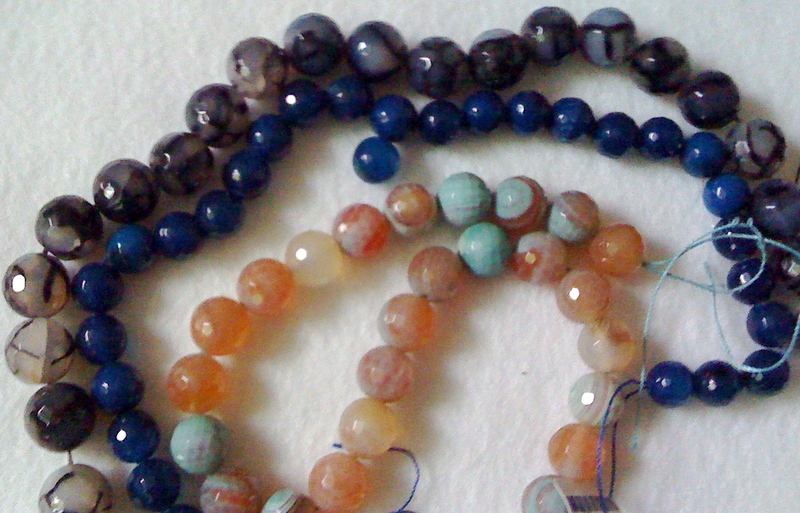 Normally, I don’t trust ultra-cheap beads—when you get used to working with quality materials, you appreciate them. But I have some stitching experiments I want to try, and I need bulk. So dollar strands seemed like a great idea. 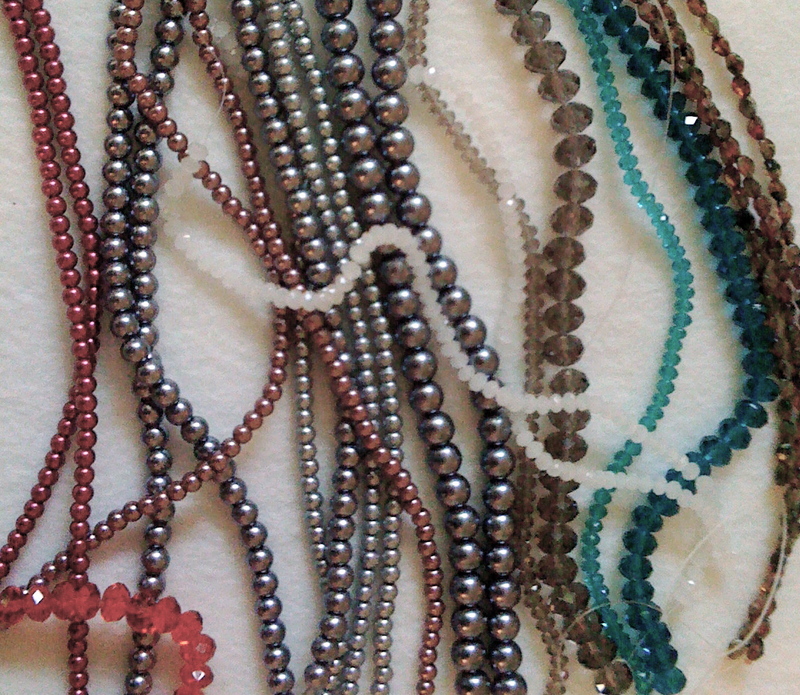 But believe me, I spent time examining each strands for regular shapes and sizes, uniform finishes, etc.—all the things you want when you are stitching with small beads. Where was the lack of quality in these dollar beads? Well, there are some slight variations in shape and size, but nothing I can’t work with. Where I really thought the dollar strands were lacking was in color. There just weren’t that many colors that excited me. Most of the time I was look through rows or piles I was thinking, “I guess this could work…” Trust me, that’s not what I usually think when I buy beads! 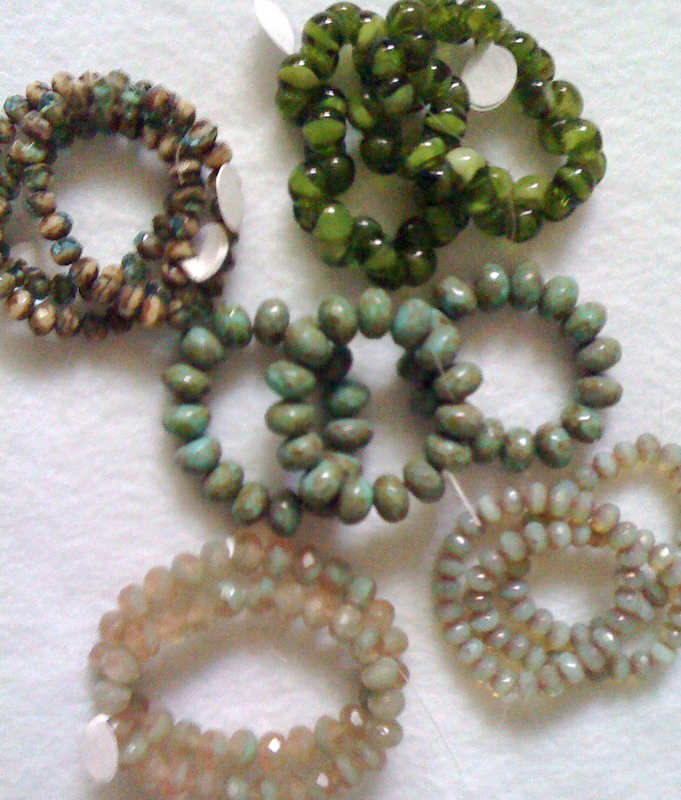 Were you at the 2011 Bead&Button Show? What inspired you? Bead&Button Show, here I come! Now, you may have noticed a gap between my first two entries on this blog. “Why would Lesley create a blog and then abandon it so fast?” you may have wondered. Let’s just say May was a very fun and busy month, and I’ve been buried in beads for the last two weeks. It’s almost show time (Bead&Button Show time, that is), and I’m teaching two classes this year, both based on projects from my book. I’m very excited to be part of the show as a faculty member this year (I’ve been staff at the show a few times too), but pulling together the kits has been a little difficult. It’s a challenge to pick colors for other people, even if you’ve heard their preferences ahead of time. I’ve been lucky enough to get some advice from show veterans, but their advice is sometimes hard to apply. My friend Anna, who’s taught for years and sells instructions and kits independently, says that it’s a good idea to make a few extra. But she’s been at the show long enough that she’s a very popular teacher, and she’s had classes sell out. My classes were no where near selling out. So pulling together kits in a situation where I can’t buy bulk, want my students to have nice materials, and don’t want to go over the kit fee is going to be a challenge. I’m a little worried that I won’t be prepared for extra students who sign up at the last minute so I’ve made quite a few extra kits. The only question left is–what do I do with them if I have extras (and I will probably have extras)? I can’t afford to swallow the extra kit costs. As far as colors, fellow beader and teacher Maggie advised me that there are two ways to do kit colors. You can either say you are a color expert and getting your colors is part of the class, or you can let the students pick the kits themselves when they arrive. She warned me that the more students you have in your class, the more likely someone will be unhappy and with the second choice there might be chaos. So I’ve assembled kits in colorways that I like (taking any student input I’ve received into account), but if I have leftover kits I might let students trade. Show week is always crazy–lots of people to talk to and places to be. I’m excited to be taking on a new role this year, but I’m also glad I get to reinforce some of the relationships I’ve already built–talk to designers and authors I worked with, former coworkers, etc.